Now that spring is here, it is one of the best times to plan your mulching needs for your landscaping in Denver, CO. Mulching is important to maintain the quality of your lawn and landscaping. Learn why you should mulch this spring, types of mulch available and tips during the process. Mulch will help your plants, trees and shrubs in a way that soil is not able to. It creates an added layer that provides nutrition benefits to the plant’s roots. When there isn’t mulch placed around a plant, weather elements can lead to important nutrients to be carried away. Mulch also helps to maintain the temperature of the plant. This added layer also works to make the plants get a proper amount of water that it needs. You will also appreciate how mulching will avoid weeds from surfacing that you would have to spend time removing. In addition to controlling weeds, mulching also helps to deter pests that might have more easy access to the tree, plant or shrub. Last, there are many types of plants that helps the overall aesthetic appeal of your home. When it comes to types of mulch to add to your landscaping, there are many go-to types. A top choice among many homeowners is shredded hardwood. You will find this mulch in a variety of colors from deep browns to red in color. 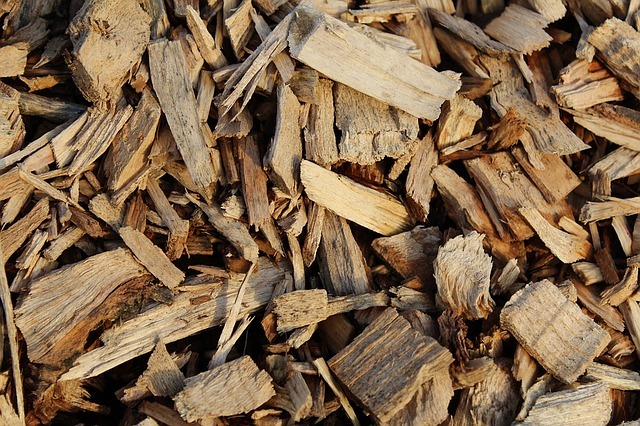 In addition, you can also find various colors of wood when it comes to mulch. Another premier type of mulch is cocoa mulch. It gets this name as it can emit the smell of cocoa. For a more natural look, you can choose to add straw mulch. It is a very natural look. You can also use your remaining grass clippings as well to serve as mulch. Last, you can choose compost as a mulch around your plants. Many love this option because it is organic and does not need to be replaced multiple times per year the way other mulches do. Prior to starting the mulching process, it is important to pull any weeds in the area you will be mulching. Once you are ready to apply the mulch, you will only need one or two inches. You want to be sure to not over-do it on the mulch as your plants, trees and shrubs will not be able to get the nutrients they need if there is too much. Around the stems of the areas you are mulching, leave a couple inches of room around them. In addition to avoiding over-mulching, be sure to learn how over or under watering can kill landscaping and reasons for Denver sprinkler repair. When it comes to your landscaping irrigation needs, Water Solutions Sprinkler Services is your local go-to place! We specialist in sprinkler installation, landscaping and design and routine maintenance. We would love to help you with all of your watering needs! Contact us at 720-435-1495 to get started on your perfect lawn.